If you installed Windows Vista, Windows Seven or newer, you probably already noticed that Microsoft removed the blinking icon which provided informations about the network interfaces traffic and connectivity in the notification area. The new icon does not give you any information about incoming and outgoing traffic activity, and now only give you the choice to open the Network and Sharing Center and to resolve connectivity problems, no direct access to the network interfaces of your computer is provided anymore. This is a notable regression in functionality, if you come from the 2000/XP world. No installation required. Just run the executable ! 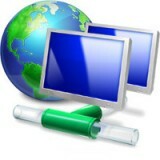 If you miss these functionalities in your Windows Vista/Seven operating system, then this utility is a must-have ! Do not wait any longer, download GabNetStats. (*) : This product is free for personal use. Corporate use is however subject to restrictions. For corporate use, please contact us. Unstable under Win 7 HP 64bit SP1. Could you tell me more about the instability you seem to experiment? So that I can correct the bug. Works well on WOW-64 (Win 7 Ultimate)- No SP. Thank you very much! i have been looking for something like this for sooo long! @Roger: I’m glad you find it useful! Do not hesitate to report any problem as I haven’t had any feedback yet concerning some eventual issues. can you put on the page on how to install it and uninstall ? Then I noticed in the “Notification Area” it had multiple notification icons for Gabnet ! It was weird. I tried installing and uninstalled the program a couple of times but it still left the “notification icon” then I searched the registry for any entries…but I figured out it was a lot easier to do a earlier restore to start again clean. I guess the only problem is the directory where it installs and the “notification area” multi Gabnet icons. Why would it have multi notification icons ? GabNetStats does not need to be installed. Just put it in his own directory (for example, “C:\Program Files\GabSoftware\GabNetStats”) and run “gabnetstats.exe”. To uninstall it, if it was set to launch at Windows start, uncheck this option, then simply delete its folder. There is still one folder where its settings are stored, usually in “C:\Documents and Settings\YourUserName\Application Data\GabSoftware”. You can delete any folder with the name “GabNetStats.exe_something” inside. You can even delete the whole GabSoftware folder if you don’t have any other of our applications installed. As for your problem to have many icons in your notification area, it is certainly because you somehow launched it several times. 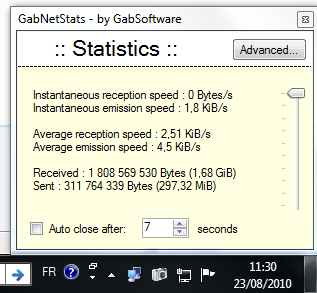 i’ve been using gabnetstats for quite some time and like it a lot. I would like to monitor 2 network connection independently. For this reason I would like to start to instances of gabnetst. This is blocked by the program as it seems. Is there a switch to switch of this behaviour? It’s not possible at the moment. But it’s a good idea and I might add it in a next release.